Can Oprah help you exercise? Working on a project promoting eHealth: the use of Information and Communication for Technology (ICT) for health, I realized (as I searched online newspapers) how little information there was. I decided, therefore, to put some information out there. The opportunity came for me when local journalists uncovered a lack of security for medical records in Jamaica’s two main public hospitals in Kingston. Here, I thought, I could make a case for electronic medical records, an area in eHealth. 1. It would be fast. Because a letter to the editor is a simple opinion piece, I wouldn’t have to worry about carefully validated research or including the opinions of experts (interviews). All I would have to do it write my own opinion (in half an hour) and send it to the editor. 2. It was more likely to be published. This because the letter to the editor is specifically designed for participation from the public. Also the timeliness of the issue (the fact that it was responding to a recent lead story) would help. The letter ended up highlighted as Letter of the Day and I received 10 comments on the online story (which is great for starting a conversation on the matter). For being chosen for letter of the day I also received a prize of a book voucher, which I donated to a school. The Caribbean Health Research Council’s 58th Annual Scientific Meeting invited interested persons to submit abstracts for this premier public health/medical conference. Manuscripts and abstracts should be submitted by email to conference@chrc-caribbean.org or chrc@chrc-caribbean.org. The deadline is November 1, 2012. There will be a special focus on Child Health, however papers will be accepted on research in all health areas. Papers are selected based on scientific merit and relevance to the priority health areas of the Caribbean. 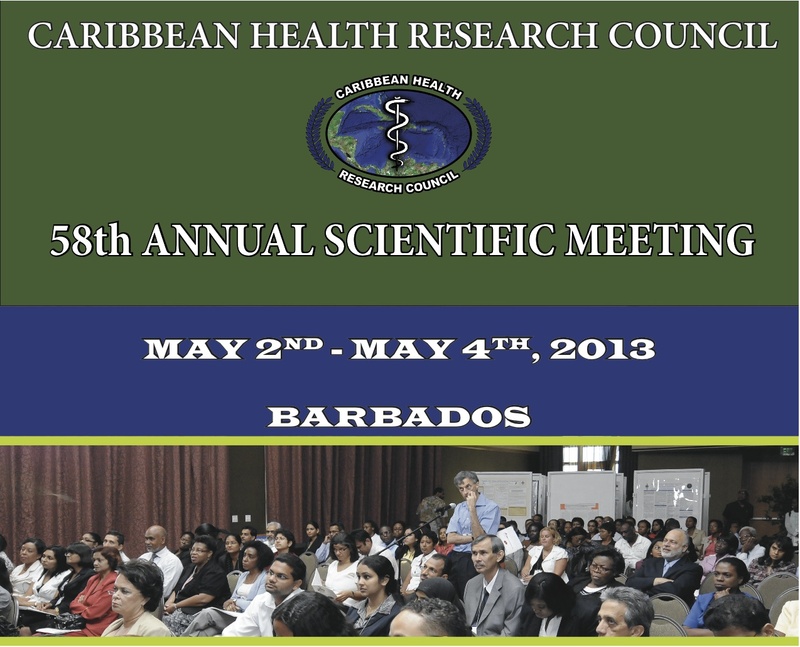 The CHRC conference will be held May 2nd-4th 2013 in Barbados. Will anyone be submitting papers on health communication interventions with children and adolescents? How about parent-child communication in various contexts? This conference mounted by the SPHHT will examine current challenges being faced within Jamaica’s public health system that is charged with protecting and promoting the health and well-being of the public. Participants will be drawn from the public-health sector in Jamaica, the medical and academic fraternities, the public sector, private corporations and the general public. Invitations have also been issued to key persons in the public-health system in the Caribbean to attend and contribute to the discourse. It is anticipated that there will be some 200 participants from Jamaica and the Caribbean at the event. The conference will open on Thursday, June 7, at 6 p.m. with a public lecture presented by Professor Sir George Alleyne, Chancellor of the University of the West Indies who will speak on the topic: ‘Public Health Challenges and Primary Health Care’. The conference will be officially opened by Minister of Health Dr Fenton Ferguson on Friday, June 8, at 9 a.m and will be held at the Wyndham hotel in St. Andrew, Jamaica. Preventing Chronic Disease (PCD) invites you to submit articles for upcoming publication. There’s been a major push towards preventing chronic diseases across the region. This presents an excellent opportunity for researchers, practitioners and others public heath professionals working in the Caribbean or with Caribbean populations outside the region. Papers should promote the open exchange of information and knowledge among researchers, practitioners, policy makers, and others who strive to improve public health through chronic disease prevention. PCD is a peer-reviewed electronic journal established by the National Center for Chronic Disease Prevention and Health Promotion. Articles focus on the latest developments in prevention, screening, surveillance, and population-based interventions that prevent and control chronic diseases and conditions, promote health, and examine the biological, behavioral, physical, and social determinants of health and their impact on quality of life, illness, and death across the life span. Types of article include: original research, community case studies, systematic reviews, essays and others. To learn more about submitting manuscripts for PCD, visit How to Submit a Manuscript. Breach of this regulation renders a person liable to a fine of $1,500 or three months imprisonment. The campaign by the social marketing group therefore rightly claims to be proactive in calling attention to this issue in Jamaica. They launched a campaign aimed at heightening awareness and behaviour change (less texting and driving) targeted at students of the University of the West Indies (UWI). The campaign recently ended but there were a number of innovative ideas employed by the students in order to communicated their message. The students drew large images of their campaign logo and slogan #dntxtndrive using chalk. This was not only interesting for passers by after completion, but stimulated interaction with onlookers about the campaign message while the drawing took place. The students used a steering wheel to dramatically walk around the campus, bumping into people as they passed as a conversation starter about texting and driving. A group of dancers partners partnered with the social marketing team to do a flashmob which would highlight the message to onlookers. And there were other great activities as well including a window wash/wipe event in the university car park and a campaign song. I was impressed by the creativity and work put in by the class to attempt a successful campaign. But, was the campaign successful? The evaluation suggested that there was only a 13% adaption of the behaviour (the target was 20%). The students have argued, however, that the campaign was implemented in less than 6 months and changing behaviour is a long term activity. Also, 13% is still a positive indicator (the campaign certainly did not cause the behaviour to change in a negative way). This is a viable argument, however one cannot help but wonder if the students should have even tackled behaviour change to begin with, given the limited time for the campaign. Awareness raising and advocacy could have been a sufficient goal for the time frame. Also, there is the question of whether the University was the best place to target the campaign. How many UWI students drive and was the campaign targeted enough specifically at drivers on the campus? On Monday, May 14 2012, the day after the evaluation presentation of the campaign by the students the Minister of Transport, Works and Housing, Hon. Dr. Omar Davies announced that persons who use mobile phones while driving will soon face fines, with the promulgation of new legislation by the end of 2012, which will make the practise illegal (view article). This cannot necessarily be directly attributed to the students’ campaign (unless Mr. Davies confirms :)) but it may have been influenced by the campaign. As such, a hearty congratulations to the students for raising awareness of this issue inside and outside of the walls of the University! View the students’ presentation here.